The State of Arizona has 130 state agencies and hundreds of applications on varieties of platforms. This session will explore their journey on bringing efficiencies, collaboration and cost savings by building a platform that is service-oriented, scalable and high performing. WSO2Con USA 2017: AESP(Arizona Enterprise Services Platform), Rollout and Adoption of a Statewide Private PaaS from WSO2 Inc.
Prasad Putta is the Director of Enterprise Technology Services at the State of Arizona Department of Administration (DOA). He is responsible for strategy, architecture and implementation of innovative IT solutions that bring enterprise-level efficiencies to the State. 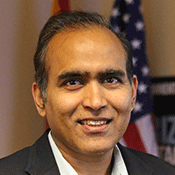 Prasad has over 20 years of software industry experience in both public and private sectors. He earned his master’s degree in Computer Science Engineering from Andhra University in India.